Reaching the port, Hydra island looks glamorous like an art-paint, with grey, white and blue colours above the blue of the sea, an exemplar of architectonics and aesthetics. The town of Hydra island, which is the centre of the whole island, is built amphitheatrically around the port, combining nature and architecture. From your very first visit, a magic feeling surrounds you. Perhaps it's in the unique architecture and graphic scenes throughout the Island, or perhaps it's in its long history and rich heritage, or even - a fusion of all. A stroll through the town's picturesque cobble stone streets, will convince you of its uniqueness. The visitor, coming for the first time, is impressed from the view of the tall buildings and Manors, which exist in the port. Right and left from the entrance of the port, there are the Parapets with the Canons, which protected the town. 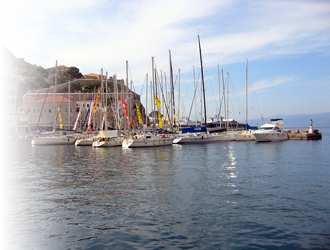 Today, the port of Hydra is filled with little and big yachts, boats and cruisers. You can walk to the port, the heart of the town, take a stroll at the tourist shops, admire the old Manors and visit the Museum of Hydra island. Also you can stroll the picturesque narrow cobble stone alleys and reach the old Settlement of the town, to the medieval fortress town of Kiafa and from there to enjoy the view toward the Peloponnese. Main characteristic of Hydra is that there are no wheeled vehicles and the transportation of people is being made only by donkeys, a thing that makes the Island even more pictursque. For swimming in the town, there are offered the rocks of Spilia, Hydroneta, and a short distance from there, Avlaki, Kamini and cosmopolitan Mandraki. The connection of the town with the other beautiful beaches, Vlycho, Saint Nicholas, Bisti ... is being done only from the sea with boats or sea taxis. 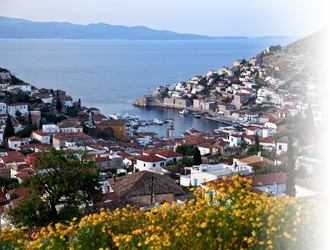 Today the residents of Hydra do not exceed 3,000 and nearly everyone involved with tourism. 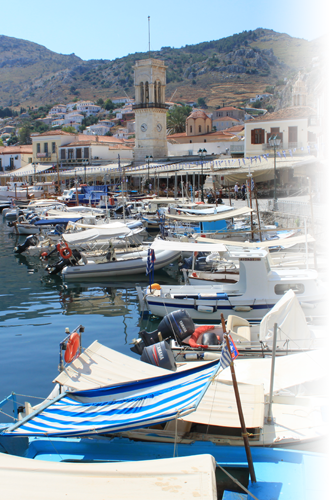 n Hydra is located the Cathedral of Hydra - Spetses - Poros -Aigina. The Cathedral of Hydra accommodates the Town Hall and the Ecclesiastic museum. Hydra is famous for the calm life is offers to the visitors in the day, but also for the intense, cosmopolitan night life. So the island each year receives a large number of Greek and foreign visitors. remains the jewel of the Gulf Islands and one of the greatest resorts in Greece.